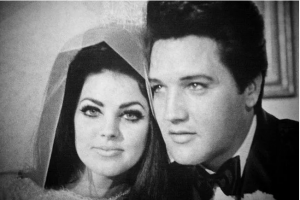 Elvis met future wife Priscilla when she was 14 and he 24; he was in the army at the time, stationed in Germany, where Priscilla’s father was in the Air Force. The fact that he started dating her when she was so young, and continued to do so back in the United States, meant he may have been guilty of violating the Mann Act, which made it illegal to transport people across state lines for immoral purposes, a fact Priscilla’s father made abundantly clear when pressuring the two to marry. According to Priscilla, their decision to marry wasn’t forced by her father; the couple had simply been content to live together without being married. Elvis biographer Rees Quinn suggests the Colonel, Elvis’s manager, also played a part in the decision. Because Elvis had a morality clause in his contract, if it became public knowledge he had a 14-year-old mistress he had no intent to marry, he would be in violation of that clause, and may have stood to loose a lot of money. Priscilla recalls a more romantic gesture – Elvis arriving in her room with an impish grin and a black velvet box containing a diamond ring.